As the plane soared through the beauteous expanse frosting the tips of the mighty Himalayas and then glided across the towering Kathmandu valley so crowded with metallic and candy-colored structures and girdled by a sea of cascading terraces, I remained unaware that the theme for the rest of the journey had already been put in place - immensity. Immensity of not only the external landscapes comprising Nepal’s unique geology and geography, but of the internal landscapes comprising the hearts of Nepali people. While the temperature may not always be the warmest in that great area comprising the ceiling of our terrestrial world, the kindness emitted from the lives therein produce enough warmth to nurture one’s soul for a lifetime. Having never personally visited a developing nation besides Mexico, I will never forget how astonishing my cab ride was from the Kathmandu airport to my hotel in Thamel. As the car snaked its way through narrow streets lined with buildings that appeared to be surrendering their existences to the offensive marriage of deterioration and gravity, my empathetic heart tried desperately to understand how these somber living conditions affected the lives of the diverse figures and faces inhabiting them and their trash-clothed vicinities. The ubiquitous presence of temples and shrines tucked within any available opening and honored amidst so many intersections and community squares seemed to quell any indignance with their continuous promise of a simultaneous existence unscathed by the physical world manifesting itself to our limited senses. Arriving at the hotel I was immediately befriended by a handsome, confident, and yet sweetly reserved receptionist named Suwash (meaning aroma), who later became my Nepali language teacher - offering great patience and an excited atmosphere about him while sharing with me several Nepali exchanges. Perhaps the most useful of these new linguistic keys was how to politely communicate that I wasn’t in need of every object being presented by the numerous needy eyes searching for a sale while traversing Thamel’s active and exhaust-laden streets. Not long after reaching my room where I was graced by views of the Swayambhunath temple illuminated on a distant hillside, I quickly discovered the concept of “load-shedding” - a euphemism for the daily experience of no electrical power for several hours at a time. Having been a wilderness backpacker for the better part of my adult years, I was quite versed in navigating life without electricity, yet it suddenly felt surreal to utilize this knowledge amidst a bustling city. From that point on having the ability to charge my camera batteries became quite the cause for celebration, and my headlamp became my favorite evening companion. Gradually erupting canine choruses seemed to dominate urban Nepali nightlife, while rituals of sunrise prayer sessions, gentle dust-removing sweeps from grass brooms across every reachable outdoor surface, and ascension to roof-tops to hand-wash and hang the days laundry prevailed throughout the early hours of every day. As tourists we quietly observed these activities while preparing for our own adventures of the day. Before embarking on the long journey to our trekking destination that would consume the remainder of our stay, we took a few days and perused several temples, squares, and World Heritage Sites - all hosting remarkable architectural details within every square inch of their symbolic presence. The rich reservoir of space enveloping these elaborate structures contained both art and artisans of the finest varieties, markets boasting colorful arrays of fresh produce, entire spectrums of dried legumes too numerous for even the most legume-savvy amongst us to identify each one, and aromatics of incense that seemed to occupy nearly every airwave. One urban highlight was our visit to the thangka school where we not only had the opportunity to witness the creation of beautiful thangkas (paintings of mandalas or deities on cloth) right before our eyes, but also received a private lesson on their history, the process of their creation, their numerous forms, and their rich symbology. The entire time I felt like a child eagerly listening to a storybook teller - completely absorbed in another world and anxious for each and every detail about these appealing displays of creativity that posses the ability to bring one's attention back to the divine nature of being. Another urban highlight was visiting the ghostly presence of the Pashupatinath temple region where we arrived in tandem with a procession for a young man whose life had ended prematurely and whose flower-adjourned body would be burnt before our eyes and hearts. Following a gentle dip of the departed’s feet in the Bagmati River, the wife and brother slowly, and with tremendous pain, circled their way around what remained of their loved one’s physical presence before allowing it to be consumed by flames. For anyone with an empathetic or even just contemplative heart, the ceremony was nothing short of painstaking - yet simultaneously possessed a strong attractive force that denied departure. The blazing burial heralded the impermanent nature inherent within all things sensible, that even amidst the daily visions of wilting flowers, animals along the roadside, or our own aging skin, we tend to ignore at deeper levels until a loved one is suddenly torn from our animated world. Nothing - not even our own bodies - truly belong to us, and so we must continually remind ourselves to cherish each moment with the essence of various beings - animate and inanimate alike. The ceremony also made me conscious of my own desire to live on as I felt I had taken so much from the Earth and from society in order to reach where I was, that I wanted to fulfill an intense urge to give back - to potentially lessen the suffering present on our transitioning planet. Although I was quite content on how I’d chosen to live my life up until that moment, and theoretically could have died happy either at that moment or any of its offspring, I realized that while I had always cared deeply for the wellbeing of others and done what I could at any given moment, I had largely been living life for myself. Now, I wanted to fully live for others - to complete the cycle of give and take. Having then exhausted the exhaust-filled urban settings, we began our lengthy journey to the clean-aired region of our trailhead not far from Sirandanda. The bus ride there was unlike any other I have experienced. Aside from the bright paintings adorning the Nepali buses whose talkative horns sounded like mobile polka parties, they were quite ordinary and simplistic in their construction. Quite unordinary, however, were these buses in the complexity of what they were forced to do. Thanks only to the skill-set and tremendous pride of the bus driver - and the narrow roads refusing any U-turns to take place - did we make it through our upwards and seemingly off-road adventure. As we were tossed and turned amidst narrow paths of rock and dirt, our hearts regularly sank to commune with our stomachs as our eyes gorged on visions of steep drop-offs within what looked like millimeters of our tires. The experience - braved also by villagers saddling the roof of an overly packed non-tourist bus ahead - truly embodied the concept of “living on the edge”. Yet make it by nightfall we did, and so began our moon-illuminated trek to our first campsite of many. The morning brought delicious tea, a bountiful local breakfast, and the medicinal laughs of children playing on the sun-glazed terraces as they helped pull each other up each level only to joyfully jump down again before making their way over for a comedic game of peek-a-boo with the foreigner. As we climbed to our next destination we passed through numerous villages where our hearts were nourished with warm smiles and welcoming, “Namaste”s (roughly translating to, “the spirit in me honors the spirit in you”). While the 7-hour climb was difficult for several less-experienced trekkers within our group, the flip-flop wearing porters who were carrying seemingly unbearable loads across their backs (hanging from a single strap across their foreheads), ascended through the steep rhododendron forests as effortlessly as the hilariously audible flocks of mountain goats that we encountered along the way. If one is without knowledge of the humorous nature of speaking goats, a moment spent imagining the soundscape emerging from old men cheering during their favorite sporting event would suit as an adequate introduction. Though our arrival to the predestined Holy Lake, “Nage Pokhari,” was bathed in a sea of fog, at sunset the fog serendipitously lifted its veil to reveal the majestic Annapurna and Ganesh Himal Himalayan ranges, both glowing with the suns final salute to the day. What happened next I will never forget - as a cloud crept its way up the “hillside” below us (the hillside towering above all the clouds, yet not technically a “mountain” amidst the over 29,000-foot Everest-acquainted Nepali terminology), a circular rainbow formed on its surface with none other encased within its center than our very own silhouettes. Beauteous plants in the foreground, a personalized rainbow stamped cloud in the midground, and the mighty Himalayas towering in the background amounted to nothing short of visual bliss. All of our hearts were smiling fully. As we vertically navigated through (immense) hillsides inhabited by self-sufficient families and comprised of seemingly endless terraces resembling that of staircases for giants, the trekking experience became increasingly unique. 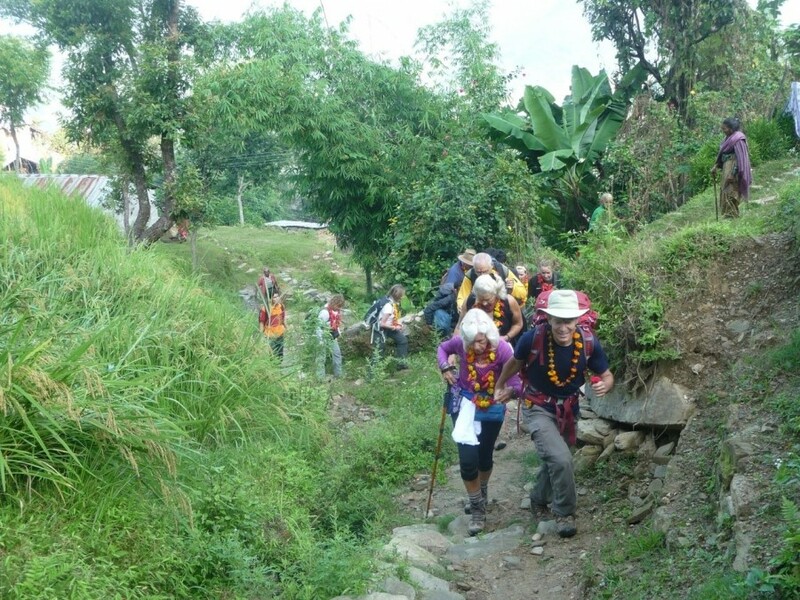 While many other treks may explore various Himalayan landscapes, none besides Ecopolitan’s Everest Learning Academy (ELA) treks will weave one so deeply into the culture and lives of the villagers that invigorate the space within. Each day we were graciously greeted by entire schools of bright-eyed and open-hearted schoolchildren who smeared red tikas (bindis between the eyebrows) on our foreheads, wrapped our necks in beautiful scarves, and sang, played music, and danced in celebration of our presence. Yet it wasn’t just the children, but entire communities who continuously came together to welcome us and acknowledge their appreciation for the work that my boss, humanitarian, hero, and friend, Dr. Adiel Tel-Oren had done to enhance the quality of their schools, education, and lives as a whole. Far from allowing us to be mere observers, however, the villagers literally pulled us into their dances so that we could feel firsthand the rhythms of their songs within each and every one of our cells. Having been somewhat of a “closet dancer” celebrating life through rhythmic movement mostly while alone or when surrounded by numerous other bodies to the extent that my own body remained largely obscured, at first this demand seemed to incessantly pinch at my ego. Yet through repetition, the dance opened up a portal within my heart as it worked to dissolve my ego with the agent of joy emerging from mutual celebration of a given shared moment. And cause for celebration there was. As we observed the state of several school buildings prior to ELA involvement, they were a shock to my western comfort-oriented senses. The furniture-free buildings that so many of these children hiked over an hour to arrive at were often composed of straw, mud, and dung, with a single minimally-exfoliated slate chalkboard hand-patted into the front wall, and roofs that far from prohibited a rainstorms entrance. One of the first things the ELA does when partnering with such a school is to provide weatherproof roofing and elevated places for the youth to sit and to write. While these two seemingly little endeavors certainly make a world of a difference, they are only part of many improvements enacted by the communion of mutual desires and persistent effort from both the ELA and the community within which each school is situated. As ELA has a policy of not “owning” a school, but instead helping to establish empowered schools by inviting entire communities to participate in the progress by whatever means possible, both pride and commitment are generated and the future is left in the community’s own sustainable hands. This is an approach that our trekking guide and dear friend, Babu Ram, describes as, “giving fish hooks, not fish”. Now, slightly over four years since the ELA’s inception, over 8,000 education-thirsty and enthusiasm-saturated children are utilizing these hooks and comprising an organization of not only schools, but child-care centers, orphanages, community outreach centers, mother’s groups, and adult literacy programs dedicated to educating, nurturing, and protecting disadvantaged Nepali youth from the lifelong shackles of child trafficking, slavery, and prostitution. The year 2014 has been particularly celebratory in that the ELA was given status as an international Non-Governmental Organization (NGO) - an honorary level bestowed to other such organizations as the Peace Corps, Greenpeace, and Amnesty International. Dr. Tel-Oren and the Everest Learning Academy have truly become living proof of the positive transformational power that one individual can have within the lives of our planet’s next generations when the forces of both heart and mind are allowed to reunite. This opportunity to help Nepali youth is nothing short of a blessing in my eyes as they harbor an abundance of qualities so easy of adoration. Not only are they beacons of love teeming with enthusiasm at the opportunity to learn, they are hosts of vitalized imaginations who achieve contentment with so little and who still invest all of their curiosities and creative desires into the real world interacting with them - not in an illusionary electronic matrix within their hands. Whether playing games with rocks, drawing in the dirt, jumping down terraces, or relishing every last ray of daylight while crossing two school benches together to create their own giggle-producing teeter totter, the joy that arises out of simplicity can not be ignored while in their midst. With the exception of the occasional (though remarkably rare) cry emitted from an infant, there were no “temper tantrums” or negative emotional outbursts witnessed. Even the pure-hearted 25 year-old principal of a school we visited told us how he arrives an hour early each day so that he can sing and dance and play with the joyous children. When asked by a fellow trekker if the children were afraid of him, he experienced great difficulty in understanding the question as he couldn’t even fathom the idea of fear entering their principal plus student equation - friendship was the only way. He immediately extended his friendship to all of us as well, staying long into the evening after the welcome ceremony had ended so that he could utilize what he called his “golden opportunity” to share thoughts, time, space, and emotion with foreigners. Inspired by Dr. Tel-Oren, this same principal was also on a mission to educate the mothers and children to eliminate illness-inducing packaged food from their lives. His desire was to educate them to both maintain bodily health and prevent the corresponding sickening of the area’s beauteous landscapes with their wasteful one-time-use wrappers (most trash becomes litter as there is no centralized trash-removal system to cause ecological blindness). This is another one of the benefits that the ELA brings to a school - knowledge that what comes from the west is not always the best, and that packaged food, certain technologies, and other western concepts, though seemingly convenient, manifest addiction, and hence dependence and ultimately disease. Fortunately, these processed foods have just begun to make their appearance amongst those terraced lands, and with proper education this potential disaster can be eliminated at its root. Rural Nepalese may never have to fear the onset of these “diseases of affluence” so rampant in the industrialized world. Instead of fearing preventable diseases or misusing their imaginations to create the type of mental insecurity or jealousy experienced by so many Americans, the worries of rural Nepalese were more tangible. Their fears consisted of growing enough food to secure basic necessities, of treating traumatic physical accidents resulting from the challenging terrain, and of preventing possible landslides that could erase entire villages and direct families away from the land, crops, and community that they know and love, and towards distant cities of alienation (which are often the only remaining option when the hill that once hosted them no longer exists). In one area we trekked through we could see an entire region that had been washed out - what once was a shelf of life-giving terraces became a vertical, nearly lifeless wall. I thought about how the fires, tornadoes, and floods that destroy our homes, at least (often - not always) leave us Westerners with the promise of returning to the land that once hosted us so that we can start afresh once again. I could not imagine having the land itself gone, with no promise of rebuilding a similar way of life. Returning to the trek, we spent many more days participating in ceremonies and becoming living floral bouquets after numerous children adorned our every strand of hair with local flowers. I experienced two particularly heart-warming moments with the village children near the trip’s end - one with a 16 year-old named Sunita during a welcome ceremony at her school, and the other with a group of 8-12 year-old “untouchables” during our “touching the untouchables” program where we share laughs, love, flowers, fun, and food (when available) with all cast levels. Before the ceremony Sunita meandered up to me with a few of her friends that soon multiplied into an ocean of young smiling girls with flowers to share. After some simple exchanges in both Nepali and English, and a lot of humorous non-verbal gesturing, she announced with sweetness rivaled not even by freshly secured honey-comb, that she loved me and would think about me and be my friend ‘forever’. Though I knew she would surely forget me through time, throughout the rest of the ceremony - even during the beautiful dance she performed - she kept her eye on me, continuously waved at me, and blessed me with her warm and radiant beauty. Dancing and giggling with her afterwards was nothing short of medicine for my soul. The other little angels that society had mistakenly labeled, ‘untouchable’, offered so much love and unselfishness that I felt humbled to be in their presence. After having given all of the floral leis that I had to the line of girls before her, I came to the last child and could not bear to leave her neck nor her heart empty - so I removed from my own neck a colorful pacshima (cashmere) lei that my dear friend Thakur had just given to me, and placed it around hers. Excitement overwhelmed her as she shared it and her luminous smiles with everyone around her. Then, quite unexpectedly she cycled back to me and returned the lei to my neck saying, “thank you so much, but I can’t take this”. Never had I seen, nor could imagine seeing, nor will probably ever see an American child be so unselfish as to return a gift that they adored. The sacred nature of her soul couldn’t have been more apparent. While I could easily fill several more pages with stories such as these, the Nepali children and their enduring communities were not the only heroes of the journey. So too were my fellow trekkers. While each one of them experienced challenges along the way, either mental or physical, they all quietly, and with minimal - if any - whining, worked their way through the turmoil and emerged as even more beautiful people than they had begun. These individuals - 5 Israelis (including one 83 year-old, Dr. Tel-Oren’s proud mother! ), 1 Indian, 1 Korean, and 4 Americans (including the videographers documenting our travels and ELA’s impact), in addition to several precious Nepalese ELA staff members, and numerous delightful Nepali porters, could also provide enough material for numerous reflective pages - each individual so unique and offering so much. So too could the experience of witnessing a wild rhinoceros eating lunch, and participating in a river bath with not only water-buffalos, but a majestic elephant as well. To prevent excess length, however, I will just confirm that the love I have for many of these great beings will remain with me until my own celebratory shedding of this limited physical life. Also lingering is gratitude both for the ability to express my thoughts and emotions in written word, and the ability to welcome the written words and ideas of so many minds, living and deceased, into my psyche through the gift of literacy - a gift whose significance weighed upon me while amongst adults who were illiterate and looking upon my written symbolism as a child observes a magician at work. One more lesson that I learned through my Nepali adventure is that contrary to what we’ve been conditioned to believe based on limited variety within American supermarkets, is that not all green fruit is unripe, and can indeed be quite sweet and satisfying - in some cases even more so than their appealingly vibrant red, orange, or yellow companions. Similar to the unexpectedly sweet green fruit, I found that while some experiences can initially appear to be uninviting, they oftentimes end up offering an unexpected, but surprisingly necessary sweetness in life. This may be precisely what Dr. Tel-Oren will be able to demonstrate through a study he is currently conducting that compares the health of the Nepalese children comprising the Everest Learning Academy, with the health of American and Israeli children across the west. While Nepalese children have remained practically unexposed to the technology and medical “advances” of western life, they have maintained their health and are free from chronic illness, whether physical, mental, or emotional. Western children, on the other hand, have largely been subjected to these industrialized variables without much choice, and despite such “advances” have reached a point where perpetual illness has come to be looked upon as normal. Vast numbers of children now have asthma and/or allergies - conditions likely to lead to additional autoimmune diseases in adulthood, all while hospitals around the nation are constructing wings devoted entirely to childhood cancer. Could it be that the sweetness of so many treasured “technological advances” in food and medicine may be an over-hybridized sweetness whose manipulated nature might actually be leading to disease, while the unexpected sweetness of the “tough undeveloped” life might set a forgotten standard of how nourishing life may be when following nature’s basic laws? What we know for certain is that the western world is breeding a culture of ailing bodies and troubled minds whereby the effects of disease will come in the form of an economy over-burdened by medical expenses. If current trends continue, how will the increasingly small population of healthy individuals compensate for the overwhelmingly sick majority in need of continuous medical assistance and care? Perhaps Dr. Tel-Oren’s research, with the help of the 8,000 current (and rapidly increasing) ELA children acting as a control group to the increasingly-ill western youth populace, can help us identify the triggers and prevent us from having to seek answers to that very question. Tying these thoughts once again into my personal Nepali adventure, I feel that it is necessary that we all let go of our learned preferences of what or whom we feel is “best” or “right” and give ourselves afresh to each other and to the world so that we can fully discover what this mystery of life is all about. Overall, Nepal and its people filled my mind with wonder and my heart with love. Seeing the way that both men and women always walked hand-in-hand and arm-in-arm - regardless of age - and the way whole communities engaged with one another and the land through stories, hard work, and song and dance, was a constant reminder of the interconnectedness that weaves all of our lives together. Let us do always what comes so naturally in Nepal - dissolve completely into each moment. With that - Namaste.